Over 27 miles and including four stops, this first leg of our Seafood Tour from Brunswick Islands to Wrightsville Beach offers a mouthwatering taste of seafood chowder, shrimp and grits, and fresh crab. It starts at the state line with hot oil. Driving into North Carolina from the south, Calabash is the gateway to North Carolina seafood, and it’s known worldwide for its style. Pick a place in this little town — Ella’s or Beck’s or Coleman’s or Captain John’s — and you’re eating some variation of a family recipe that started more than 60 years ago. 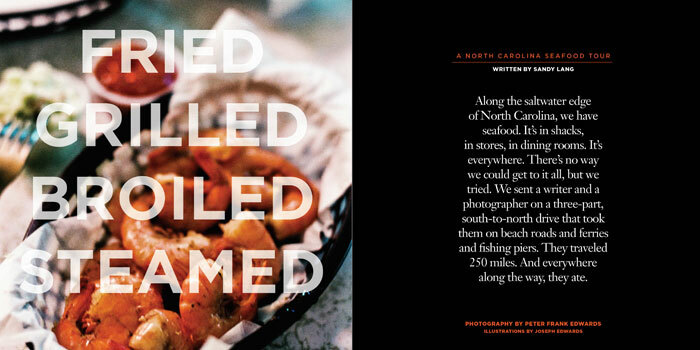 North Carolina seafood starts golden brown. Just up the road, if you veer off the northern path of N.C. Highway 179, yank the wheel right, and head east into Sunset Beach. The last place before crossing the bridge is Twin Lakes Seafood Restaurant, where Ronnie and Clarice Holden have served up a taste of the Brunswick Islands for 40 years. Now you’ve tasted it. Now you’re ready for an entire coastal run. On our tour of North Carolina seafood, photographer Peter Frank Edwards and I take the ferry from Southport to Fort Fisher to cross the Cape Fear River. Sandpipers skitter on the banks. Soon, we roll off the boat and past the wind-sculpted trees at Fort Fisher. At Kure Beach, we can’t miss the fishing pier, extending out from the shore for 712 feet. To reach the pier, you walk through a pier house store that sells ice cream cones, T-shirts, and sharks’ teeth jewelry. The wood-floored space smells of coffee and popcorn, and on one wall are hundreds of snapshots of people posing with fish. One of the draws to Michael’s Seafood Restaurant — aside from the huge, glowing aquariums around the bar and the oversize mermaids painted on the walls — is the restaurant’s “Captain M’s Seafood Chowder.” Made with clams, crabmeat, scallops, and potatoes, the cream-based recipe earns owners Shelly and Michael McGowan top awards at chowder competitions. In a booth under a tiki-style thatched roof, we devour two bowls and go to bed. Our midday plan is to drive 20 miles directly to Wrightsville Beach for lunch, but we end up stopping at the sight of the bright, blue-painted Seaview Crab Company on Carolina Beach Road. Inside, Joe Romano stands among buckets of blue crabs, bushels of oysters, and long cases of fresh fish on ice. He explains that he’s one of the three owners and that the company got its start in 2004 when he and his brother began crabbing after graduating from the University of North Carolina at Wilmington. They’re part of the future for North Carolina seafood. The shop carries locally harvested fish and shellfish, and the customers are a mix of old-timers who know the seasons for shad roe or mullet roe, and the new wave of younger people who are interested in eating local food (they sign up online for the shop’s email list). We continue on to Wrightsville Beach and park in an oceanfront lot just behind the sea oats and sand fences. We climb the stairs to the Oceanic restaurant, known for its prized beachfront perch. People fill the window-facing seats, and more sit outside on an adjoining pier, where tables overlook the sand and sunbathers below. Chef Tim James is from Raeford, and he’s busy in the beachside kitchen. He says that depending on the season, the restaurant kitchen dishes up 500 to 2,000 plates each day — of shrimp, scallops, flounder, oysters, and more, in all manner of preparations, sauces, and sautés. And because of the prime position on Wrightsville Beach, it’s entirely possible to taste the restaurant’s blackened flounder with pancetta and shrimp at the same time that a few dozen yards away, someone on a long board tests the surf.